The story of Minions begins at the dawn of time. Starting as single-celled yellow organisms, Minions evolve through the ages, perpetually serving the most despicable of masters. Continuously unsuccessful at keeping these masters-from T. rex to Napoleon-the Minions find themselves without someone to serve and fall into a deep depression. 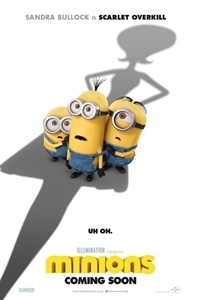 But one Minion named Kevin has a plan, and he-alongside teenage rebel Stuart and lovable little Bob-ventures out into the world to find a new evil boss for his brethren to follow. The trio embarks upon a thrilling journey that ultimately leads them to their next potential master, Scarlet Overkill, the world's first-ever female super-villain. They travel from frigid Antarctica to 1960s New York City, ending in mod London, where they must face their biggest challenge to date: saving all of Minionkind...from annihilation.